16ga.com ~ View topic - Grouse Hunters - Opening day plans? < 16ga. General Discussion ~ Grouse Hunters - Opening day plans? Here in the midwest the grouse season is upon us and opens September 15th in Michigan. I usually don’t do much that early, but it has been cool and I am going to head up to open the Camp on September 14th. The dogs are in shape and I have just started to work them on a few birds to knock the rust off (mostly me). The Cruiser is ready and so is my gear. So early on the 15th I will start to check out some new coverts and probably take in a couple of favorites to see if the seed stock was successful. I bought a new 16, mainly for pheasant, but I was hoping it would be ready, but I don’t think my smith is going to finish it. I am adding a wood extension, some cast, and having a couple of spots on the barrels touched up with some rust bluing. What plans do our members have? Opens the 16th in MN. Will hunt locally first day or two. On to Wisconsin & Lake Superior & the Bayfield Peninsula for a cast & blast trip for several days. Opening day here in Pa is the weekend of Oct 15th each year. My buddy Ken owner of the Shooting Star Gun Shop will be here for the 1st week. I have no plans to due any dog training and we will have a nice time with our 16 Gauge double guns. I acquired a nice J.P.Sauer 16 that I want to shoot a few Grouse with. Should be a great opening day. Opening day was the 1st here in Oregon. In southern Oregon we can expect temperatures in the 100s this weekend with really bad smoke. The wildfires across the west are really hurting air quality. Looking forward to rain and cooler temps. Here in the Midwest grouse season opened yesterday. Had several points, hunting partner collected a chicken on a fine, relatively long shot. The opening day Browning 16 was shot just once, at a passing dove, and Gene knocked that one down with his 12ga. We then each committed 20ga on doves the rest of the day. We walked in on the first point and as the birds went up we just stood there and watched them. Don't know if it's not wanting to disturb the quiet, letting the other guy shoot first (we each had birds clearly on our respective sides), or something else I can't conceive, but this has happened before on the first birds of opening day. After a 40 year opening day tradition I shifted last year to holding off until the first weekend of October. The plan is to wait again this year before heading into the woods. It's less about the heavy tree and ground cover and more about the warm temps. We never had much success and the time on the ground was limited as dogs struggled with the heat. Only situation which might get me out there sooner is a cool weather day. My wife and I and our girl Josie went out this AM in the smoke filled mountains of SW Montana. Two young Blue grouse ended up in our vests. Josie got a snootful of young grouse feathers in her mug - a very happy girl. Looking forward to another Montana autumn and the bird hunting memories yet to be made again this year. I'll wait. Mid-September is still summer around here and my dogs and I are cold weather machines. The year of the picture below was an exception. The morning temp was 30 degrees I took member Black Belt and dear old Jazz and we had a wonderful hunt on that unseasonably crisp day. Not opening day, but I'm spending Oct 10th thru the 21st in Pittsburg NH! Can hardly contain myself! Either going to take the Ory and Duquenne 16ga. or a 20ga damascus Flues. Like stepping back in time! If you can read a map and follow a compass you will not get lost. 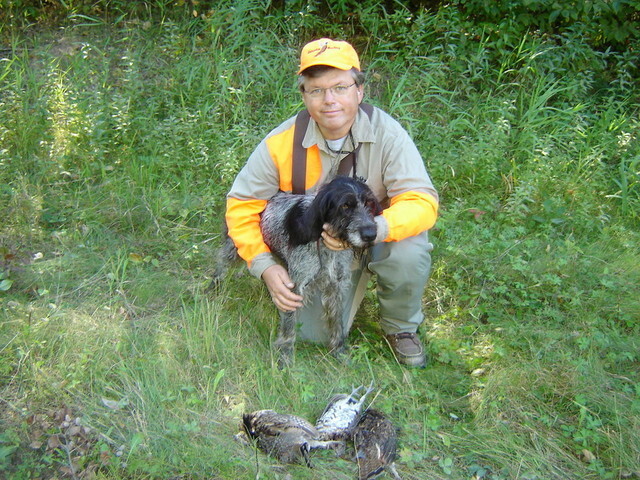 I would not pass up a chance to hunt grouse in Michigan, although the numbers will be better in a couple of years. The Apostle Islands are a nice spot, but I have never hunted that neck of the woods. More over by Hurley and south to Mercer. I heard your drumming counts were up quite bit in MN, so good luck on your ventures.